All good quality arresters have much in common. This first in a series of articles, sponsored by NEMA Surge Arrester Section members, covers what to look for in that quality arrester. purchasing high-voltage surge protective devices. What Is a Quality Arrester? The definition of quality is dependent on the type of arrester under consideration. For example, for a distribution arrester, the ability to disconnect itself from the system in the event that it is overloaded is a critical characteristic. However, for a station arrester, this disconnection capability is not even considered. Then again, for a transmission line arrester, the disconnecting capability again becomes high on the list of quality characteristics to be considered. 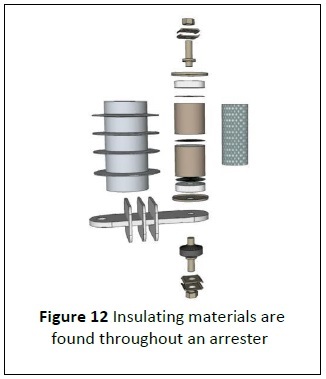 This article will cover all three of these arrester types. years. This design combines the best of the previous polymer-housed and porcelain-housed designs. The critical characteristics for this arrester type start with a rubber housing that can withstand years of abuse in any environment. The list of critical components is shown in Figure 1. The distribution type arrester differs from the station arrester in that it is installed for lightning protection only. This small but critical component of the power system stands guard over the lines that serve the end customers. Likewise, the main function of the transmission line arrester is to protect the system from damage due to lightning. A vital component of both distribution and transmission line arresters, but not station class arresters, is the disconnector. This part is the device that removes the arrester from the system should the arrester become a short circuit. A very undesirable event on a distribution system or a transmission system is a sustained outage. If the disconnector were not used, a failed arrester would short out the system and result in a sustained outage. With a disconnector, if an arrester fails, the disconnector operates and removes the arrester from the system, causing no more than a blink on the system. If the goal is to install the arrester and forget about it for decades, then quality housing must be first on the list of essential qualities. Not all polymer materials are equal. Make sure the one you choose has a solid history in severe environmental conditions. The supplier will be able to provide you with significant support through tests and field experience with the materials they use. Ask for it! Good lightning and switching protection is what you are paying for when you purchase an arrester. 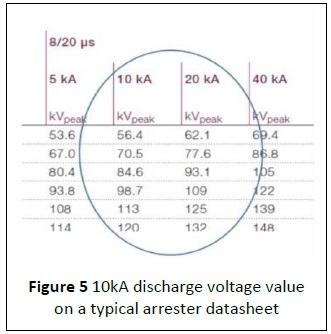 Discharge voltage is the measure of this protection, and the lower it is, the better it is. Consideration of this critical parameter should always be paramount in the selection of an arrester. Additionally, a good quality supplier will always have an audit trail to verify the published characteristics of their arrester. 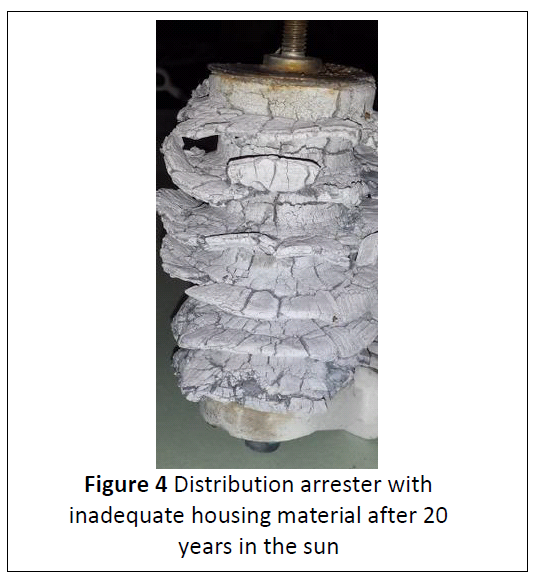 If an arrester is overloaded beyond its design capability, it is important that it does so in a manner that does not put nearby high-asset-value equipment in jeopardy. 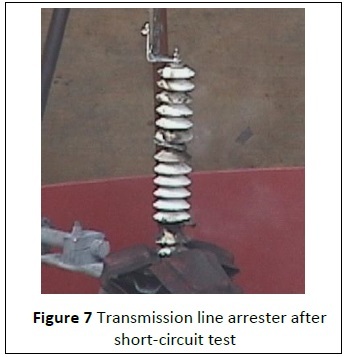 To ensure that the claimed failure mode of an arrester is as published, the certified test report for the arrester should be available and from a reputable laboratory. The tests are highly complex, and running them incorrectly can result in arresters that are not capable of the important fail-safe mode. Talk to your supplier about this parameter. unfortunately, they are not. The sealing function of the arrester should be a primary goal in both the design and manufacturing process. When selecting a good quality arrester, be sure to ask for proof that the arrester will withstand all expected environmental conditions and how it is verified. The Institute of Electronics and Electrical Engineers (IEEE) standards offer a minimum set of tests that must be passed, but good quality arresters are tested beyond the normal standards. 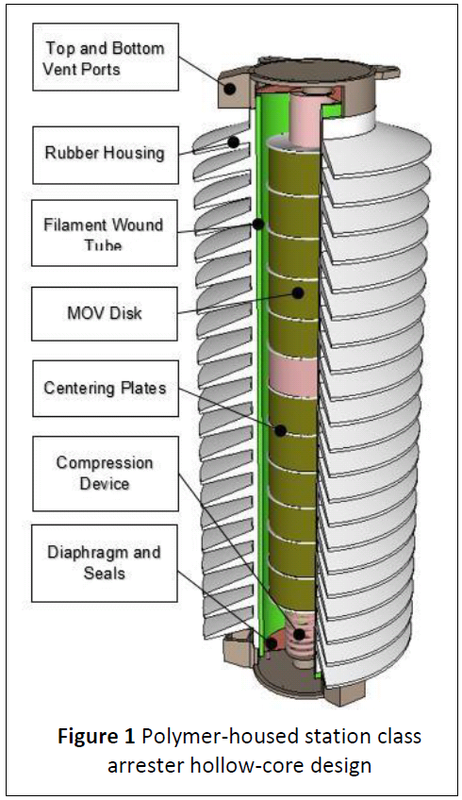 The metal-oxide varistor (MOV) disk is essentially the heart of any arrester. 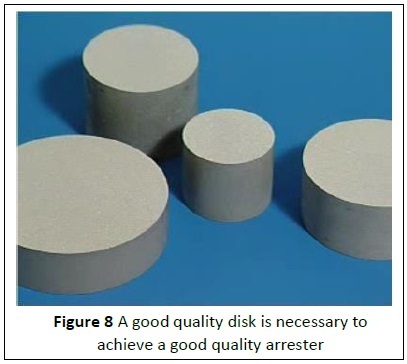 Without a quality disk that performs as specified, the arrester will not provide the desired system protection. This critical component that cannot be overlooked with respect to arresters is covered in detail the next article. long term-resistance to weather. 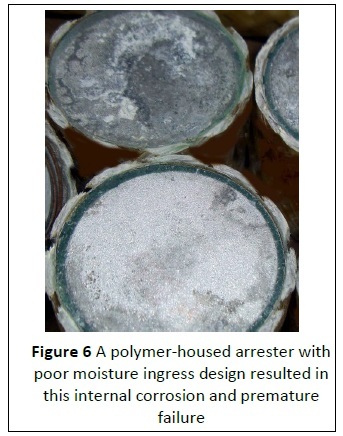 Rust that forms on a connector can wash down the arrester housing over time and reduce its wet flashover capability. 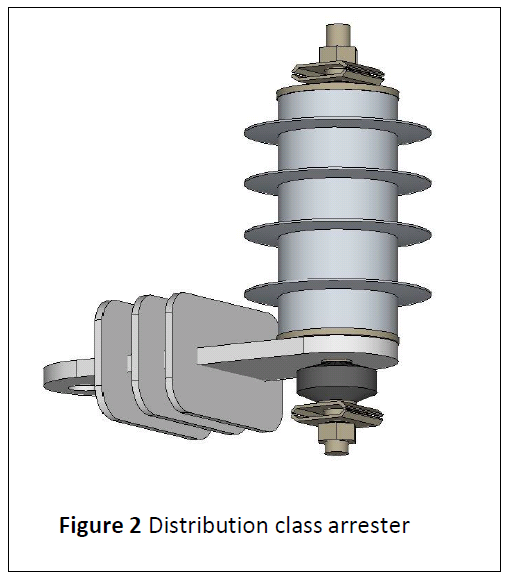 The arrester disconnector is, in some cases, equal in value to the entire arrester. This is because the long-term outage it helps avoid can cost far more than the cost of the arrester. 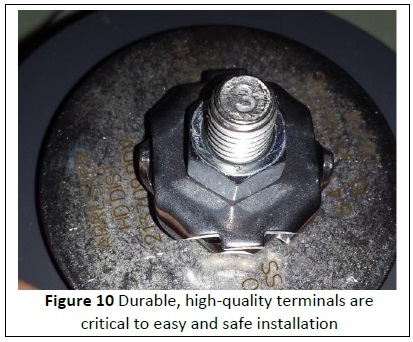 When selecting a good quality arrester, make sure you know the history of the disconnector you are purchasing. Questions to consider are: how long has the design been in use, what is the theory of operation, how low and high in current will it operate, and how is its performance verified at the factory. 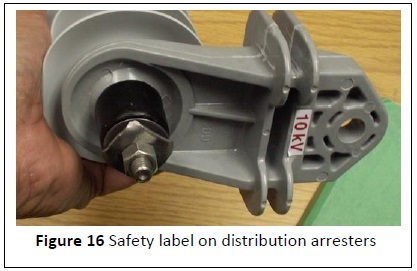 Furthermore, a good quality arrester will have a disconnector that is USDOT-approved for non-hazardous transportation. This means that if it is ever involved in a fire it will not explode and put first responders in harm’s way. In the event that an arrester is overloaded, it is imperative that it vent any internal gases rapidly and efficiently to avoid a complex fracture and potential collateral damage. 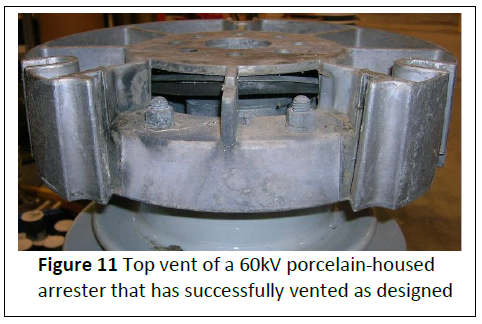 Both polymer- and porcelain-housed arresters must perform flawlessly in this scenario. dielectrics wherever it experiences a voltage stress during its long life. Because arresters have been in use for so long, high-voltage dielectric materials are well known by all manufacturers. A good quality arrester design will only use insulating materials that have a proven history of high-voltage applications. 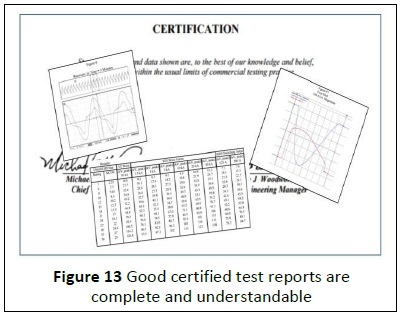 For those that wish to look further into the quality and design of a selected arrester, the certified test report is the place to go. Manufacturers of good quality arresters will always have this data available to the user. The data needs to be clear, concise, and accurate. The tests need to follow either IEEE C62.11 or IEC 60099-4. The data should be self- explanatory and understandable. 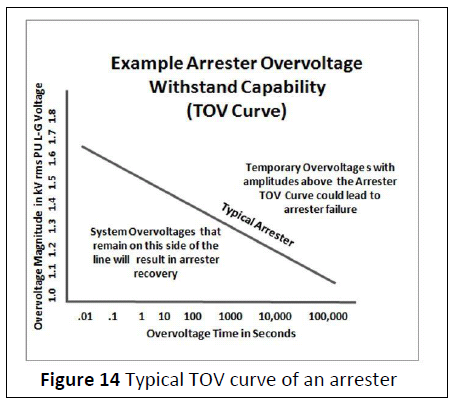 High power frequency withstand (or TOV withstand) capability is not a given in an arrester as shown in Figure 14. Some arresters have very poor temporary overvoltage withstand capabilities and can fail during a single line to ground fault on a system. For this reason, it is good to use only arresters with high TOV withstand capabilities, as verified with the TOV curve in either the catalog literature or in the certified test report. It is also important that this characteristic be verified routinely during production. packed in an 18kV carton, the installation of the 10kV arrester could be hazardous to the installer. 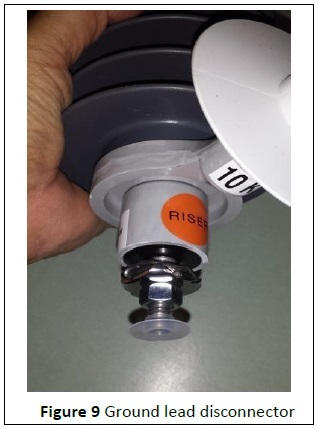 With a large label on the product it makes it easier for the installer to see the rating and lowers the chances of a dangerous installation. This is the third arrester label on good quality arresters and should be required by all users for the safety of all. 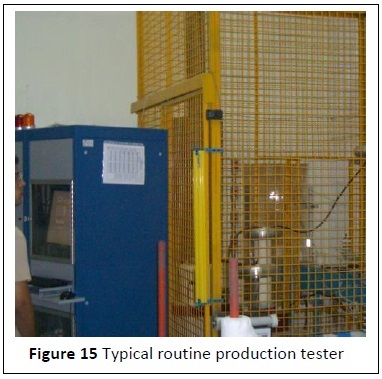 Routine tests on arresters and arrester components are critical to the production of a good quality arrester. Discharge voltage, TOV, watts loss, leakage current, and partial discharge are all critical parameters that should be within a manufacturer’s specifications. Designing and manufacturing good quality arresters requires testing and characterization beyond the standards. Many additional checks and tests are made to ensure the quality of every arrester put in service. One of the best ways to ensure that you will receive a quality arrester is to look to a quality manufacturer. This article has been sponsored by members of NEMA Section 8LA, who invite you to visit their facilities to witness quality firsthand.